Beseme is a free patten from the Berroco website. "This crochet scarf is a play on scale. 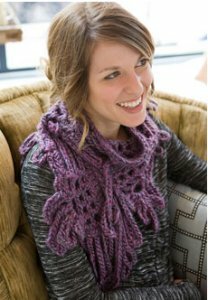 Super bulky yarn becomes a flirty lace web; the whole project takes only a few hours to make, but the impact will last all winter long. " US N (10.00mm) crochet hook is required but not included. Finished Measurements: Approximately 10" wide (at widest point) x 66" long to end of longest loop. Gauge: 9 DCs equals 4.5 inches.